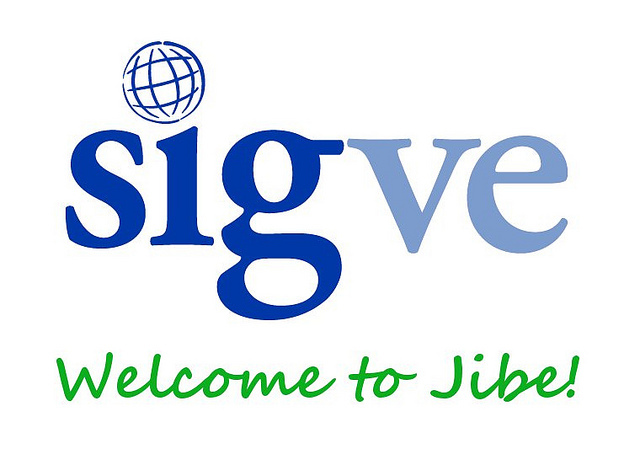 ISTE SIGVE (International Society for Technology in Education – Special Interest Group for Virtual Environments) is a group of educators, administrators, and educational technologists who are interested in the development of 3D Virtual Environment platforms for connection and collaboration. They hold online meetings each month, and on May 17th they invited me to speak to their group about Jibe and Virtual Worlds on the Web. Folks logged in to my Jibe world where I addressed the group using voice while people asked questions in text chat. We sat around for a brief introduction then went on a walking tour to illustrate how Jibe can be used to create immersive and interactive learning experiences. I also spoke about the unique affordances of having a 3d virtual world embedded on a web page. I had a few slides which I displayed in a frame on the webpage where my Jibe world lives. This made it easy for people to click through the slides while we moved around and explored the 3d space. Snapshot of my web page during the meeting. Exploring a model of the Great Sphinx, imported from Google Warehouse. We had a peak of 22 simultaneous users during the meeting and over 100 unique visitors over the course of the entire day. Because of its low bandwidth requirements, Jibe can scale nicely to handle many concurrent users. Data throughput during the meeting of about 20 people was on average about 100-200 kbps for the entire server. Compare that to a virtual world environment like Second Life which requires a connection speed of at least 500 kbps per client. This presentation was a lot of fun, and I want to personally thank Scott Merrick for inviting me and everyone else who helped organize it. Thank you! This entry was posted in Announcements, Avatars, Education, Jibe, Presentations, Unity3D, Virtual Worlds and tagged avatars, education, innovation, iste, Jibe, learning, metaverse, online communities, pioneers, ReactionGrid, sigve, strategy, Unity, Unity3d, virtual worlds by John "Pathfinder" Lester. Bookmark the permalink.